The Hylton Center in Manassas, Virginia, is a beautiful location right here in Prince William County that fully rivals the theatre experience you would get by driving into DC. They are also fantastic about offering performing and fine arts for children and families. We were able to attend their kid-friendly concert this spring called “Kaleidoscope” and really enjoyed it! This summer they’ll be offering a few different kid-friendly arts options for Prince William County residents and families! 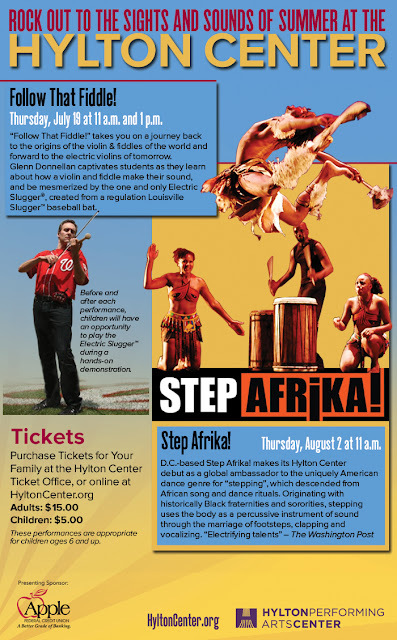 Check out Follow that Fiddle, or Step Afrika this summer, which are being presented at great times for kids- 11am/1pm for Follow that Fiddle and 11am for Step Afrika.